I like my broiler. Its almost as hot as a professional "salamander" and makes an extremely tasty steak. It browns meat and almost anything else quickly and easily. My broiler is not unique or new; in fact it is 10 years old. Many people I know have redecorated their kitchens with ovens that are either similar or superior to mine. 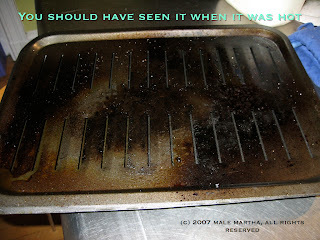 Which leads me to a question: why can I not find a broiler pan that doesn't warp when placed in my broiler. I just bought a new broiler (a Roshco "Commercial Quality") and made steak last night. On its first use, the thing, warped up at least one inch during cooking. I made another one this afternoon, with a similar result. In fact, I can't remember the last time I broiled a steak in any oven and the broiler pan didn't warp, making even cooking more difficult. I can't figure out why all of the various makers of ridiculously expensive cookware can't make a broiler pan with a heavy drip pan that will withstand warping in the heat. There has got to more of a market for this than for the Paella pan that all of them seem to sell for several hundred dollars! Just to check, I went to Amazon, Sonoma, All-Clad and Calphalon's web site to make sure I didn't miss anything. No such luck. I do not have any particular advice on how to avoid warpage, so this is more of a rant than anything else. I try to move the meat around the pan as much as possible so it cooks evenly. But the whole thing irritates me. Broiling is common, professional salamanders are still rare, and someone should manufacture a heavy, heat resistant broiler pan. I wholeheartedly agree. Can they also figure out how to make one that is self-cleaning?